Dr. Kumar has owned South Coast Pet Hospital since July 2012. She completed her undergraduate studies in Biology and French at Wellesley College, followed by her veterinary studies at University of Pennsylvania in Philadelphia. After graduating from veterinary school, she completed a rotating internship at Animal Surgical and Emergency Center in Los Angeles. She worked as an emergency clinician for five years at VCA West Coast, a local large referral and specialty hospital. Dr. Kumar loves treating all companion animals, but has a special interest in the care of exotic pets including small mammals, birds, and reptiles. She has extensive experience in emergency medicine and enjoys that fast pace and diverse nature of the cases. In her free time, she loves outdoor activities with her husband and daughter (Aria). Don’t forget to say hi to her best friend Omi, a rescued cocker spaniel mix – he comes to work with her every day! Dr. Aramburu received his doctor of veterinary medicine degree from Purdue University, College of Veterinary Medicine, a rigorous program in a major academic division of the university. Dr. Aramburu has been practicing small pet veterinary medicine since 1999 and has an extensive wealth of knowledge in geriatric and internal medicine. When he’s not treating patients, Dr. Aramburu loves spending time outdoors with his wife, three children, and two dogs. Dr. A joined the South Coast Family in August 2017. Dr. Yatabe received her Bachelor’s Degree in Animal Science from UC Davis in 2012. 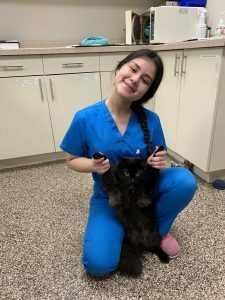 She graduated Veterinary school from Ross University School of Veterinary Medicine, located in the Caribbean on the island of St. Kitts and Nevis, and spent her clinical year at Louisiana State University School of Veterinary Medicine for my clinical year. She has special interests in Ophthalmology and Dermatology. In her free time, she enjoys traveling with family and friends, relaxing at the beach, and a good Netflix binge. She is a fur-mother to two dogs, Kona and Seth, and a cat named Lilo. She joined the South Coast Pet Hospital family in November 2017! Dr. Greco has been board certiﬁed in veterinary surgery since 2007. He is a 2002 Phi Zeta graduate of the School of Veterinary Medicine at the University of California, Davis. Upon graduation, he completed a rotating internship at the University of Pennsylvania, School of Veterinary Medicine. He received his formal surgical training at the Animal Medical Center, in NYC, the oldest and most established post graduate veterinary training program in the country. Dr. Greco manages our complicated soft tissue and orthopedic surgical cases.